Vince and Barbara Dooley recently joined Winship's advisory board, saying they want to join in the fight against cancer at Georgia’s only cancer center designated by the National Cancer Institute. Winship Cancer Institute of Emory University has been rated "Outstanding" by the National Cancer Institute, which has renewed Winship's designation as an NCI-Designated Cancer Center for five years. 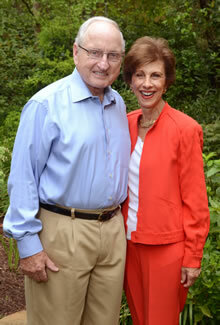 Saying they want to do all they can to help win the fight against cancer, Coach Vince Dooley and his wife Barbara will serve as Honorary Grand Marshals of the Winship Win the Fight 5K Walk/Run on Sat., Oct. 13. "We want to support the research going on right here in Georgia, and we want to do what we can to intensify the fight against a disease that claims more than 14,000 Georgians a year," said the legendary Coach Dooley, who was treated successfully for throat cancer five years ago. "Georgia and its people mean a lot to Barbara and me. If we can help in the fight against cancer in our state, then we will do that. And we believe that the best way to help is to support the excellent research programs under way at Winship Cancer Institute." Vince and Barbara recently joined Winship's advisory board, saying they want to join in the fight against cancer at Georgia's only cancer center designated by the National Cancer Institute. Barbara Dooley, a breast cancer survivor, said she wants to do her part to be sure that cancer researchers receive the support needed to improve survival rates of all cancer types. "The level of research that occurs at Winship is world-class," Barbara Dooley said, "and it is the number one cancer research center in Georgia. I can't think of a better way to win the fight against cancer than to lend my support to the work underway at Winship." Winship's second annual Win the Fight 5K will take place on Sat. Oct. 13. The course, which runs through the Druid Hills Neighborhood, is USTF-certified and a Peachtree Road Race qualifier. The starting line and finish line are both located at Emory University's McDonough Field complex on Asbury Circle on the west side of the Emory campus. Registration is $25. Participants can organize teams or raise funds in a variety of ways and direct their fundraising efforts toward the Winship cancer research program of their choice. Register early at http://winshipcancer.emory.edu/winthefight5K. Walter J. Curran, Jr., MD, executive director of Winship, said he is thrilled that the Dooleys are joining the Winship team. "I attended medical school here in Georgia when Coach Dooley was leading the Georgia Bulldogs to a National Championship, and I always admired him not only for his coaching ability but also for his leadership," said Curran, a former high school track coach. "I never dreamed that one day he'd be on my team. Coach Dooley has long stood out as a leader with a keen mind and a big heart, and he certainly understands the importance of cancer research." Late-comers can register the morning of the race beginning at 7:00 a.m. Starting time is 8:30. Ample parking is available at no charge in the Peavine Parking Deck on campus. For more information, log on to http://winshipcancer.emory.edu/winthefight5K.